Although I've been using Haiku (and earlier Senryu) for some years, only today, when I saw this thread in the Haiku forum, did I come across the very useful Stack and Tile (SAT) desktop feature in Haiku. It's been around for some time but has only been included in the OS since R1A3. Essentially, it offers a couple of very tidy solutions to handling multiple open windows on the Haiku Desktop. This video, as well as this wiki entry, explain much more eloquently than I could, how Stack and Tile works. Then, hold down the Windows key while dragging the window you want to SAT with another if you have a Windows keyboard. On my EeePC 901, I can use the Home key (bottom row, third key from right) to do the same job. On a Mac, use the right Alt/Options key. This simple little utility really adds a very important extra dimension to Desktop activities in Haiku. I bet this is something we'll eventually see on other OSes, too. 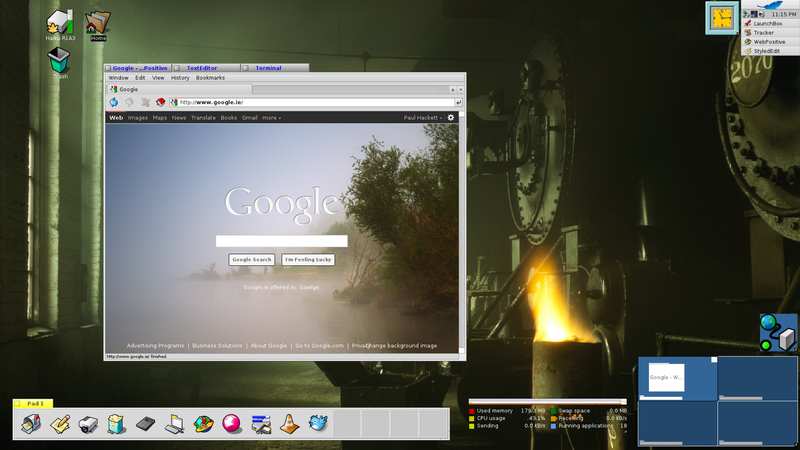 The screenshot is R1A3 on my Dell E520 where I've added Styled Edit and Terminal tabs to a Web+ window.